Earlier today Google unveiled their new Google Instant Pages which made you search easier and less time consuming. Now Google at Search Event in San Francisco announced a new way to search for a thing.Search by Image. Once again Google saved your time. Many times we don’t know the name of the place or the thing we want to search or we got the picture of the place and need to see the name of that place, but we didn’t had any resources or any thing to see for the specific thing. 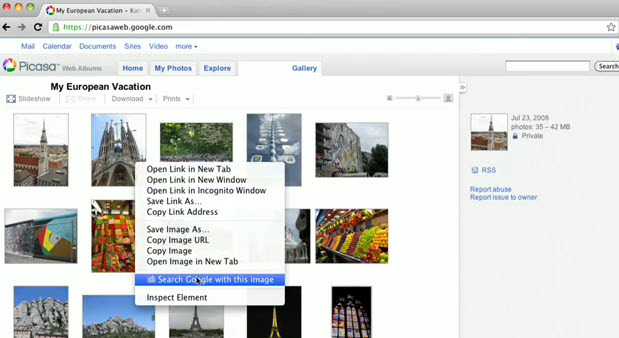 Now Google made our life more easier by Implementing the Search by Image feature on Google Chrome Browser. To Search with Google it is very easy to search for a thing. All you have to do is just drag and drop the respected picture and rest leave to Google. Google will find the respected image and tell you all the details. If you want to get this awesome feature, so don’t think just click here and get this awesome Plugin for Google Chrome and enjoy the new feature.